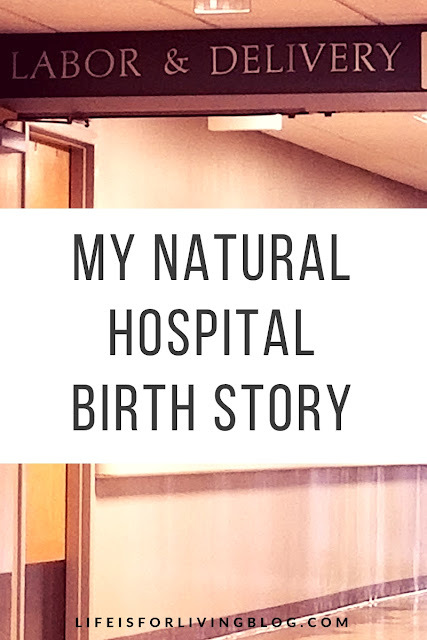 As I mentioned briefly in a post a few months ago, I knew I wanted to have a natural birth from the moment I found out I was pregnant. Actually, I'd been researching local obstetricians since moving back to Alabama, and I'd found the doctor I wanted to use if I ever got pregnant...even though he was nearly two and a half hours away. The day I got a positive pregnancy test result, I called this particular physician's office and scheduled my first appointment. I received a ton of criticism for choosing to drive so far for prenatal care (nearly everyone tried to convince me I'd give birth roadside, which as you'll see, is quite humorous), but I really felt like this physician was my best chance at having the natural, low-intervention, epidural-free birth I wanted. After a long, somewhat difficult pregnancy, my due date finally arrived, and baby did not. I had an appointment with my OBGYN, Dr. J, on my due date, Monday, September 10, and I went in hoping that he would check my cervix and find me dilated enough to send to the hospital. I'd been having mild to moderate contractions for a few days now, on and off. 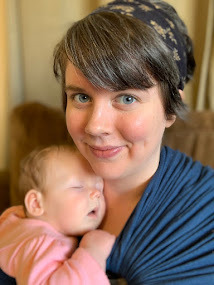 The pattern was unreliable, but I was so tired of being pregnant, so over being huge and uncomfortable and vomiting multiple times a day, I was hopeful that my body was secretly progressing. Me on my due date, September 10, 2018. Dr. J checked me and said I was at 2 cm, but the baby was still "sitting pretty high." I kind of wanted to cry, but he reassured me that something was happening; 2 cm was better than 0. He estimated the baby would come within the week, but it could be sooner if he did a membrane sweep. My membranes were stripped around 10:30 AM, and it was a pretty unpleasant, albeit quick, ordeal. Soooo much pressure. He warned me there would be spotting afterward, and I'm so glad he did, because within the hour, it looked as though I'd started my period. I was sore for the rest of the day, but that was it, except for a few small contractions that fizzled away. The next morning, September 11, I passed what was very obviously my mucus plug at around 8:00 AM. I knew we were making progress now and expected to go into labor any time, but nothing else happened. Until around midnight. With my due date behind us and the doctor two and a half hours away from our house, we had decided to stay with my parents from September 10 until the baby arrived (they just so happened to live in the same town as my OBGYN, so it worked out well). I was sleeping in my sister's bed while she took the couch, and my husband slept on a twin air mattress in her bedroom floor. Some time in the wee hours of September 12, I began having contractions again, this time more intense and more regular, but I was able to fall asleep after each one. Then at 3:50 AM, I had one so strong, I woke up for real and could not go back to sleep. I grabbed my phone and pulled up Full Term, a really handy contraction-tracking app I'd downloaded, and began keeping up with them. They were a little over a minute long and about three minutes apart. I kept up with them and made sure they were the real deal for a little over an hour before waking my husband. We arrived at the hospital a few minutes before 6:00 AM. They hooked me up to the monitors and saw that yes, I was having regular contractions, and the pattern looked like baby was on his/her way. Then the nurse checked my cervix. 2 cm. Two days after my having my membranes stripped, after all these contractions, I was still at 2 cm. However, this time, I was 50% effaced. So we were progressing. 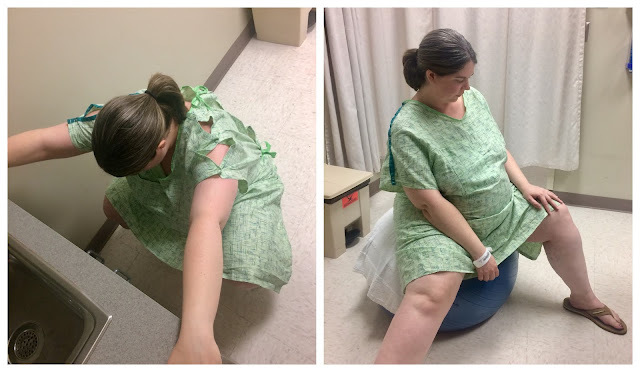 The nurse taking care of me in labor and delivery triage gave me a birthing ball and suggested I bounce around on it a while, do some squats, and walk the halls for at least two hours to help get things moving. Dr. J would be coming in for surgery soon, and he would be by to see me as soon as he could. So, Matt and I started roaming the halls. I walked up and down the stairs until I couldn't handle it any more. I did some lunges. We rounded the L&D unit for two hours, then went back to our triage room, where I alternated between deep, one-minute squats and bouncing on the ball, all the while having regular contractions that I couldn't talk through. I was still bouncing around on the ball when Dr. J showed up around 11:30 AM. He checked me and gave me some promising news: I was now at 3 cm, 70%, and the baby had dropped a good bit. But. It was still gonna be a while. Like, 24-48 hours, he guessed, with me being a first-timer. He gave me two options: 1) go get some lunch and come back to be admitted, 2) stay and be admitted now. It's hospital policy for laboring mothers to have nothing but water and ice chips by mouth until after birth, so this was his (greatly appreciated) way of letting me eat something before what would most certainly be a very long labor. We took the first option after Dr. J promised we wouldn't have the baby in a restaurant. I figured I should load up on carbs before getting into this marathon, so we went to Mellow Mushroom. After being on a carb-restricted diet for weeks, I got exactly what I wanted, ate every bite, and drank tons of water. 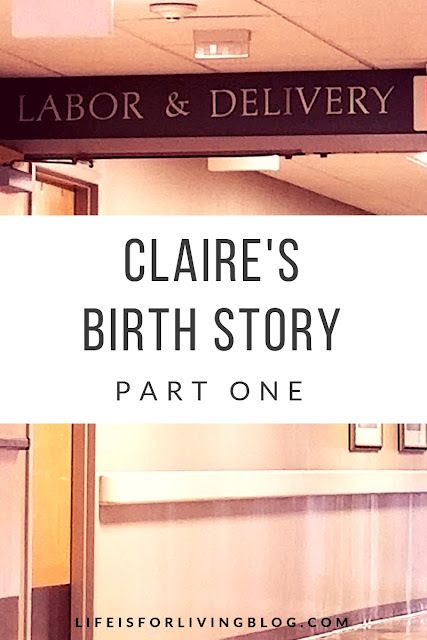 My contractions remained fairly strong throughout our meal, causing me to wince/double over and focus on deep, controlled breaths, and I have to say, I felt really weird and uncomfortable dealing with that in the middle of the lunch rush at Mellow Mushroom. I was happy to be going back to the hospital when we were finished, for sure. We went back to the labor and delivery unit, and this time, they put me in a proper room. The nurses had a copy of my birth plan, which they discussed with me; I was to do this as naturally as I could, pain-medication-free, and my husband was to be my birth partner (or "dadla" instead of "doula", as one nurse joked). Since I'd tested positive for Group B Strep, they started an IV and began administering fluids and preventative ampicillin. For the next several hours, I continued having contractions, but they never seemed to intensify. I wasn't sure if that was normal, or if maybe I had a high pain tolerance, or if we simply weren't getting anywhere. But the pattern remained regular, and it hurt way too much to rest, so I felt like I was progressing. 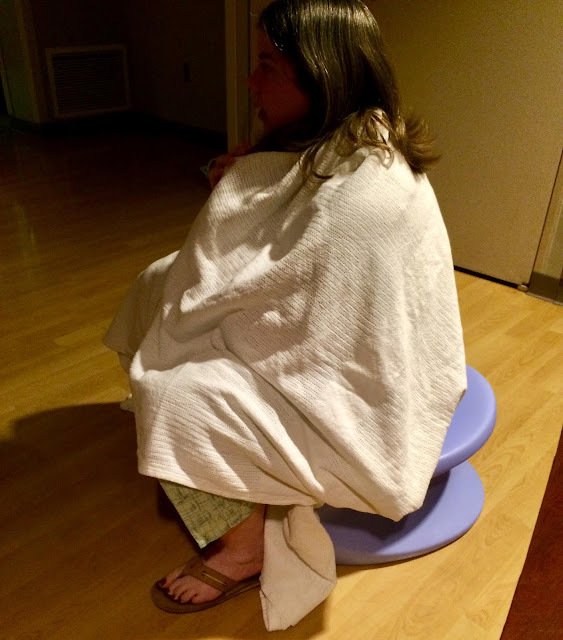 At around 2:00 AM on September 13, I got back on the birthing ball and used visual imagery to cope with the pain. I put in my earbuds, pulled up some soothing yoga music on YouTube, and tried to pretend I was somewhere else (it didn't do anything but frustrate me though, because I could hear my husband snoring on the pull-out sofa over the music). I started having chills, and my nurse brought me a heated blanket, as well as a birthing stool to see if that could provide some relief and help bring baby down. During this long, tiring night, my nurse asked me multiple times if I "just wanted to induce yet" or "had thought any more about inducing" and I had to keep telling her "no, I want to wait" through the pain, to which she curtly replied, "Dr. J said you'd say that." 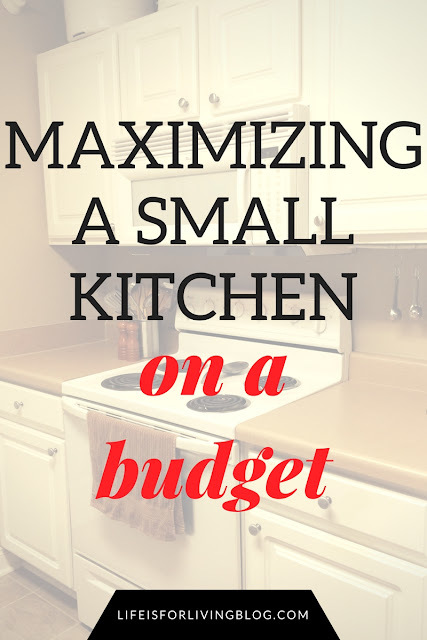 It grew harder and harder to stand my ground each time, and I grew more and more annoyed, wishing she'd stop making these suggestions when I had a birth plan I was trying to stick to. I felt like I was moving too slowly for the staff's convenience, that maybe I was holding up a bed someone else could be using and they were trying to get me out of there. This was somewhat true, I learned, when the doctor came around to check me at about 8:00 AM. I was completely discouraged when Dr. J told me I was not progressing. I'd been doing this for over 24 hours now, and I was still at 3 cm, still at 70%. Even worse, he now offered two options: 1) induce, which he knew I didn't want to do, or 2) go home until contractions got more intense. He recommended the latter. But more intense?! I was already struggling to deal; would it really get more intense than this? "You'll know the difference," he said, which really ticked me off at the time. I was so grouchy and frustrated and exhausted, I don't know what I said. I'm pretty sure I just pouted and said nothing after I told him I didn't want to induce, I still wanted to try to let my body do its own thing. I burst into tears when I got to our car, then I really lost it when I got back to my parents' house and saw my mom. I was just so upset to be leaving the hospital still pregnant. Everyone was pretty bummed, but no one more than I was.